American Wolf: The Million Dollar Quartet At 60. The Million Dollar Quartet At 60. On December 4, 1956, Jerry Lee Lewis was at Sun Records playing piano on a Carl Perkins session when Elvis Presley came to the studio to say hello to some old friends; not long thereafter, Johnny Cash swung by to pick up a paycheck. The four began jamming, Sun founder Sam Phillips switched on the tape, and the legend of the Million Dollar Quartet was born. There have been great dates in rock and roll before and after, but none so great as this one, 60 years ago today. You've got February 9, 1964, when The Beatles played on The Ed Sullivan Show, and July 25, 1965, when Bob Dylan "went electric" at The Newport Folk Festival, but in those cases, historical context is the main driving force and the taped performances are secondary. The Beatles sound fine enough, if a bit rushed and nervous (for good reason), while Dylan's electric outfit sounded under-rehearsed and poorly mixed (which some claim is the real reason for the booing). In both cases, it is the audience that is the key element of the performance. 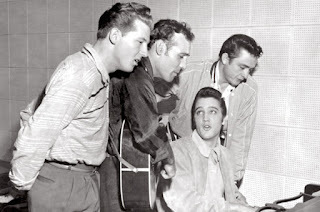 When Elvis, Jerry Lee, Carl, and Johnny jammed at the Million Dollar Quartet, there was no audience. Or not a traditional one, anyway. There were friends, girlfriends, and hanger-ons, and eventually the press as the ever-resourceful Phillips called the Memphis Press-Scimitar--people drifting in and out of the storefront studio. Instead of playing for audience, they were instead playing for each other, playing for history, and playing for posterity. They were playing for us. I remember first being told the myth of the session when I visited Sun Records as a teenager. I dutifully bought the then-current 1990s release of the recordings and raced to listen to them. I figured it would be a Sun Records greatest hits album times four. "That's All Right," "Blue Suede Shoes," "Whole Lotta Shakin' Goin' On," "I Walk the Line," all the rest. This was gonna be great. Turns out I was very wrong. With the exception of Elvis's "Don't Be Cruel"--more on that in minute--there were none of these hits, or any others. In fact, there was a lot of gospel. And country. And blues. And some more gospel. As I kept listening, what had initially disappointed me about the session was the key to its invaluable worth. It was less a traditional rock and roll album as it was four founders of the music giving a history class. This was their common ground, a meeting place of fervor and joy. Which makes sense. If you got George Washington, John Adams, Thomas Jefferson, and Alexander Hamilton together, they'd probably be talking about Locke and Rousseau, as opposed to themselves. But ironically, the finest moment of the session does come the one time one of the legends sings one of their biggest hits. Elvis had recently gone to Las Vegas and bombed, but while there caught a show by the R&B vocal group Billy Ward and His Dominoes. Despite the name, Ward was never the lead singer of the group, he was instead its founder and manager. The group first launched Clyde McPhatter--one of Elvis's biggest influences--who then left the group for his own major solo career at Atlantic Records. If Elvis had gone to see the Dominoes for his idol McPhatter, he was to be disappointed as a new singer was in his place. Elvis remembers the singer trying to do a few of his songs--"Hound Dog" among them--but striking out. Then, he does "Don't Be Cruel." It was slower and more slender than his own version, Elvis explained, but in the end it was better than his. Elvis then tries to imitate the young African-American singer, who in turn was trying to imitate Elvis. "You know I can't be fo-oo-ound," Elvis sings while a guitar strums. "Sittin' home all a-ha-lone--" Then Jerry Lee's piano marches in with all of the subtlety of an elephant. Soon Carl's electric guitar snaps right in there too, while his band, still in their seats from his session, backing Elvis. "Don't be cruel," Elvis sings. "To a heart that's true..." As the group crashes to a finale, you can hear them reaching for the sound Elvis hears in his head. They don't quite get that sound, but what they create is even more exciting and visceral. Elvis keeps going back it, talking about how that young R&B singer emphasized "tel-e-phone" and how he stepped back with his head shaking, "I don't a-want no other a-love-ah..."
It turns out the singer that Elvis had gone to see was none other than a young Jackie Wilson, already proving himself to have the most exciting timing (and punctuation) of any singer of his era. On the original 1990s CD I got of the session, "Don't Be Cruel" was sandwiched somewhere in the middle, with the gospel stuff on top and country run-throughs on the other side. Now, with the 50th Anniversary album that came out a decade ago, the chronology was mended and more songs were added to make a clearer picture of the day. First we get Carl and Jerry Lee playing an instrumental, before jamming on "Jingle Bells" and "White Christmas," still with no vocals. Elvis steps out of the booth to talk about (and sing) Lowell Fulton's "Reconsider Baby," one of his favorite songs, which he will later record on his first album after being discharged from the Army. Although he is partially off-mic, he sounds just as he will in the familiar version from 1960. Then comes "Don't Be Cruel." It is the first complete performance, and the place in which everything comes together. This is clearly what Elvis is most excited about, and is eager to convey to his friends and fellow musicians. From there, they slip into parlor music ("There's No Place Like Home") and a spiritual ("When the Saints Go Marchin' in"), and then into a string of gospel standards that are among the most memorable performances of the day. Elvis sings "Peace in the Valley" with all of the sorrow and regret that is only hinted at in his later studio version, "Down by the Riverside" and "I Shall Not Be Moved" are made into a cross between jump-blues and doo-wop. "I am with a crowd, but oh so a-looooone," Elvis sings beginning the next set. The full band is gone, though Carl and Jerry Lee are still unhand to offer vocal support and ideas. Elvis's girlfriend requests "Farther Along," which again takes them from spiritual music to parlor music, followed by Elvis running down a list of his favorite songs, alternating between country and gospel. Carl gets in a lovely take at the gospel song "Keeper of the Key"; Elvis sings the praises of Pat Boone and his latest record, "Don't Forbid Me." Then, just when you think it's all gone off the rails, they come together in the united front of Chuck Berry, all jamming on "Brown-Eyed Handsome Man." Elvis can't remember the words, so Carl and Jerry Lee help, coaxing him along, reminding each other of verses, laughing at jokes in the song that have become so familiar even the most ardent rock fan has forgotten they were ever heard as comical punchlines. They are like a bunch of old friends at the back of bar right at last call, playing to see if they can make it to the next verse. It is loose, easy music, with a sure sense of freedom. Elvis then touches on "That's When Your Heartaches Begin," one of the first songs he recorded as an acetate at Sun, and brings the story full-circle. Then, he seems to disappear, and all that is left is Jerry Lee Lewis, ready and eager to debut the sides of his recent first release, "Crazy Arms" and "End of the Road." He then reaches back into the rag "Black Bottom Stomp" and then the Gene Autry standard "You're the Only Star in My Blue Heaven," and then you can hear everyone shaking hands and saying goodbye. There has been over 45 performances of some 40 songs, including rock, pop, R&B, blues, country, bluegrass, spirituals, gospel, and Christmas songs. There have been standards like "When the Saints Go Marching in," "White Christmas," and yes, "Don't Be Cruel"; there have been obscure tunes like "Keeper of the Key," "Out of Sight, Out of Mind," and yes, "Don't Forbid Me." There have been songs that have been performed by Louis Armstrong, Bill Monroe, Jelly Roll Morton, Chuck Berry, Little Richard, Charley Patton, Bing Crosby, Jackie Wilson, The Ink Spots, and Gene Autry, not to mention songs sung by slaves, sharecroppers, and the Union Army of the Civil War. And yet for all there is, let us pause to consider what there is not (at least to my ears, anyway): Johnny Cash. Some have speculated that Cash only showed up for the newspaper photo shoot but split before the tapes began rolling; contemporary reports have him singing "Blueberry Hill" with the others, although that song has never been found with the tape. Cash himself claims in his autobiography that he indeed was there and can hear himself singing, only he is farthest from the mic and is singer in a higher range than his usual hit sound. Maybe, but try as I may (and have), I can't hear him. Also, the fact that at one point Elvis's girlfriend asks "this Rover Boys' Trio" to sing a song leads me to believe there were only three principles there for the main part of the recording, as well as the fact that Elvis later mentions Johnny Cash by full name, in a way that seems to imply that Cash is not on the premises. This is not to take away from the power of the sessions. If anything, it adds to their mystery. For even without Johnny Cash actually there (audibly, anyway), so much is. There is the stream-of-conscious history lesson of modern American music. There is the only known recordings of Elvis and Jerry Lee together. And there is the only full-length recording we have of Elvis talking at length and off-the-cuff about music. Seems crazy, but it's true. It all adds up to a session that for me encompasses the whole of rock and roll, much more than a greatest hits album ever could. That said, the latter is almost too irresistible--just check out The Million Dollar Quartet musical by Floyd Mutrux and Colin Escott, which uses the session as a heavily-fictionalized structure by which to tell the story of these Sun Records legends, greatest hits and all. This is all well and good and I'm glad it gets the myth and music out to an even wider audience, but for me, the real magic is in the tape from December 4, 1956. For all of its bum notes and tangents (both musical and conversational), it is a testament to a brave new music, the young men who made it, and the old world that they conjured up in doing so. The Worst Of 2016: Donald Trump.